Registry First Aid 7 Platinum, from Avanquest Software, is a comprehensive, powerful and user-friendly registry cleaner which is designed to fix and optimize your Windows registry aimed for a more reliable and faster computer. Registry First Aid 7 Platinum normally costs £29.99 for purchase. As part of Avanquest promotion, the company is now giving away the free license codes of Registry First Aid 7 Platinum to the interested users. To grab a free copy of Registry First Aid 7 Platinum full version, visit the promotion page to submit your details. 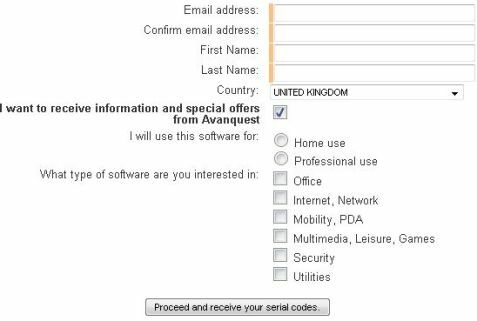 Shortly, an email (from claire.goodwin@avanquest.co.uk) containing a free license serial code for Registry First Aid 7 Platinum will be delivered yo your registered email address. Download the setup installer for Avanquest Registry First Aid 7 Platinum: registry_first_aid_7_us.exe. Avanquest’s Registry First Aid 7 Platinum is compatible with Windows XP, Windows NT, Windows Server 2003, Windows Vista 32-bit/64-bit, Windows 7 and Windows 7 32-bit operating systems.